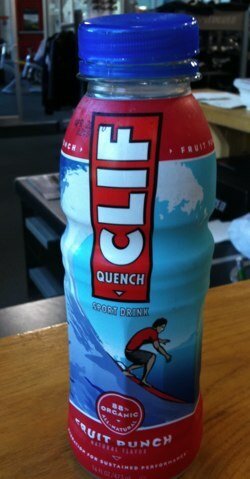 I love Clif. I think it’s very important right off the bat to say that, so you know that I’m not some Hammer-gel-loving-Clif-bar-hating extremest here. To paraphrase Office Space, “I celebrate their entire catalog.” That is up until now. Jumping into the sport beverage market Clif has released the Quench line of sports drink, an 88% organic (and 12% petrochemical? Kryptonian? poison?) drink that’s just unfortunate to taste. The beverage begins with a fake-fruity taste with a top note of salt and a lingering mouth feel of Elmer’s glue. It is, quite a bit, like drinking runny mucus. After the initial shock, the mouth is left with a sort of sour-milk cloyingness. Clif, I implore you, beg you, plead with you, go back to the drawing board with this. Find out what’s so great about your Clif Shots (they taste like a snack, not like a pile of sugar and salt) and why people love Glaceau’s Vita Water (it doesn’t taste like someone spit in my mouth) and give us something that lives up to your other fine, fine products.